Coric improves to 7-0 in deciding sets, Dimitrov, Wawrinka, Pella also win first-round matches. The European clay-court season began in earnest at the Rolex Monte-Carlo Masters on Sunday, complete with cool (12º Celsius) temperatures and rain-filled skies. With a slate of four first-round main draw singles matches scheduled on the grounds of the Monte-Carlo Country Club, nestled in the Principality of Monaco that overlooks the Mediterranean Sea, it was enough to whet a tennis fan’s appetite. The skies also opened up for a while and wet upon the red clay, too. 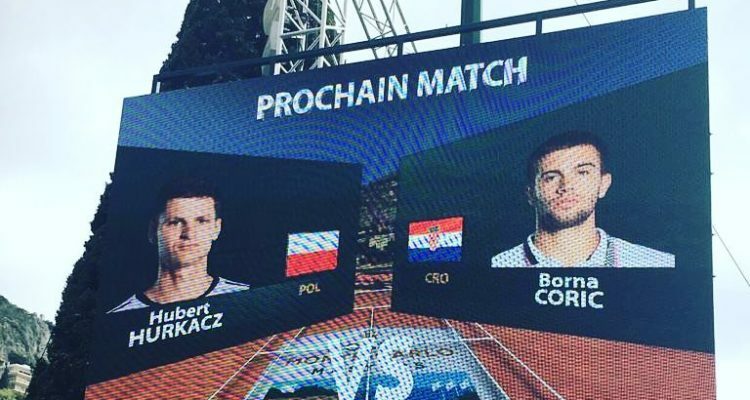 Ninth-seed Borna Coric of Croatia, competing in his fifth Monte-Carlo tournament and the only seeded player in action, christened play on Court Rainier III against Hubert Hurkacz of Poland with a 6-4, 5-7, 7-5 win to advance to the second round. Next, he will oppose either 556th-ranked Lucas Catarina of Monaco or 60th-ranked Jaume Munar of Spain, both wild cards. While it took two hours and 52 minutes for the 13th-ranked Coric to improve his record to 7-0 in deciding sets this year, three different rain stoppages stretched the duration of the first match of the day to nearly five hours. Coric and Hurkacz, both 22, split the first two sets before rain suspended play at 1:06 p.m. local time, after they had completed one hour and 51 minutes of play. The court remained covered for almost two hours before play resumed at 3:02 p.m. However, it was short lived as another rain delay forced the players off at 3:28 p.m., with Coric up a break and serving at 3-2. The 52nd-ranked Hurkacz, who was playing in his first Monte-Carlo, broke back as both players encountered difficulty in holding serve during the final set as the red clay played slow. Finally, after breaking Hurkacz for the fourth time, Coric served it out and won on his second match-point opportunity for his 10th victory of the season. He outpointed his opponent 108-107 by hitting 31 winners. Meanwhile, 36th-ranked Stan Wawrinka, a five-time quarterfinalist who won Monte-Carlo in 2014, returned to Court Rainier III against Lucas Pouille of France. The 31st-ranked Frenchman has been struggled of late and was looking for his first win since reaching the Australian Open semifinals in January. It didn’t happen. Instead, the 34-year-old Swiss needed just 65 minutes to win 7-5, 6-3 for his 12th victory this season, and, next, will take on either 53rd-ranked Damir Dzumhur of Bosnia or No. 11 seed Marco Cecchinato of Italy. Also, last year’s semifinalist Grigor Dimitrov, who has reached at the least the quarterfinals in three of his last six main-draw appearances at Monte-Carlo, advanced over 54th-ranked Matteo Berrettini of Italy, 7-5, 6-4, in one hour and 53 minutes. Next, the 29th-ranked Dimitrov will face either No. 15 seed Denis Shapovalov of Canada or 45th-ranked Jan-Lennard Struff of Germany. Finally, in a match-up of Brazilian clay-court champions, 34th-ranked Guido Pella of Argentina (who won the Brasil Open earlier this year) bested 32nd-ranked Laslo Djere of Serbia (winner of the Rio Open), 6-7 (2), 6-2, 6-4, in two hours and 25 minutes. Next, Pella will oppose No. 7 seed Marin Cilic of Croatia. While the main draw began play on Sunday, the qualifying draw concluded and three seeds advanced into the main draw while three seeds were upset. Moving into the main draw were: No. 4 seed Juan Ignacio Londero of Argentina, No. 5 seed Aljaz Beene of Slovakia, and No. 7 seed Federico Delbonis of Argentina. They were joined by Alexei Popyrin of Australia, Andrey Rublev of Russia, and Guido Andreozzi of Argentina. No. 2 seed Ugo Humbert of France fell to Rublev, 6-4, 6-4. Lorenzo Sonego of Italy advanced on a walkover. • Coming in, Rafael Nadal at 31 years 10 months is the oldest Monte-Carlo champion. The youngest is Mats Wilander at 18 years 8 months. This year’s oldest player at Monte-Carlo is Philipp Kohlschreiber at 35 years 5 months. The youngest is Felix Auger-Aliassime at 18 years 8 months. • Play resumes on Monday with 15 singles and five doubles matches starting at 11 a.m. local time. Four seeds – No. 10 Daniil Medvedev of Russia, No. 15 Denis Shapovalov, No. 13 Fabio Fognini and No. 17 Kyle Edmund – will be in action on Court Rainier III. This entry was posted in ATP Tour, ATP Tour News and tagged ATP Tour, Borna Coric, Monte Carlo Rolex Masters.